Release Date - January 1979. Album Type - Seven Inch E.P. (Extended Play). Format - 7 Inch Vinyl. Engineer - Roy Neave/Keith Herd. Mixed By - Nick Cartwright. Drums By - Frank Noon (borrowed from The Next Band). Recording Costs - £148.50 (borrowed by Joe from his Dad, Joe Senior). Vinyl Pressing Costs (First 1,000) - £450 (borrowed by Joe from co-worker). 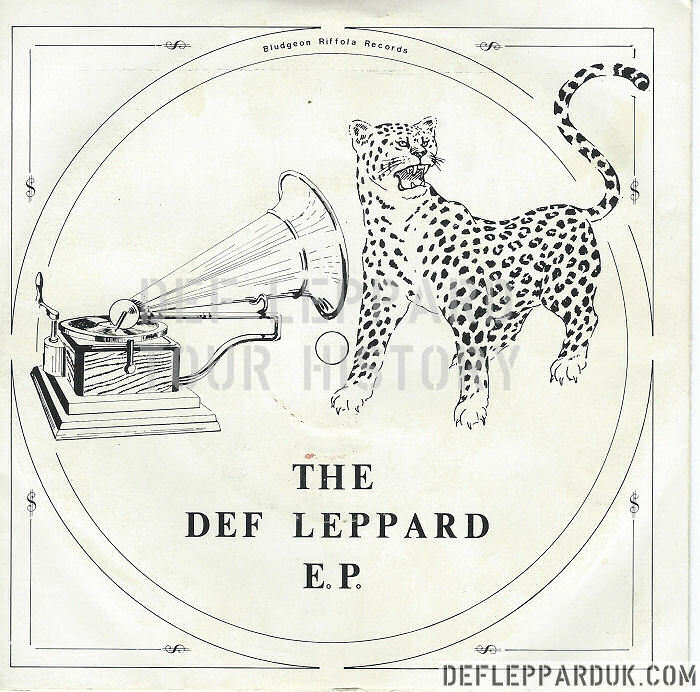 Picture Sleeve Costs - £65. Cover Art - Dave Jeffery. Back Sleeve Photography - John Wood. Potrait Sketches - Colin Woodcock (on 500 lyric sheets). "Special Thanks to our Mixer Man Mr. Nick Cartwright whose name was thoughtfully left off the E.P. cover.". Thank You List - Tony Kenning (original drummer), Paul Ainsbury, Kevin Clark (Steve's brother). Thank You List - Ian Flint (Joe's childhood friend), Russ Major (roadie until 1983), Craig Robertshaw. Thank You List - Andy Smith (Joe's friend and co-writer of 'Sorrow Is a Woman'), Keith Strong (journalist). Thank You List - Pete Titterton, Dave Walker, Gary Ward, Rent-a-Crowd (friends/road crew). Studio - Fairview Recording Studio, Hull, England. Recorded - 25th/26th November 1978. UK Record Label - Bludgeon Riffola Records. 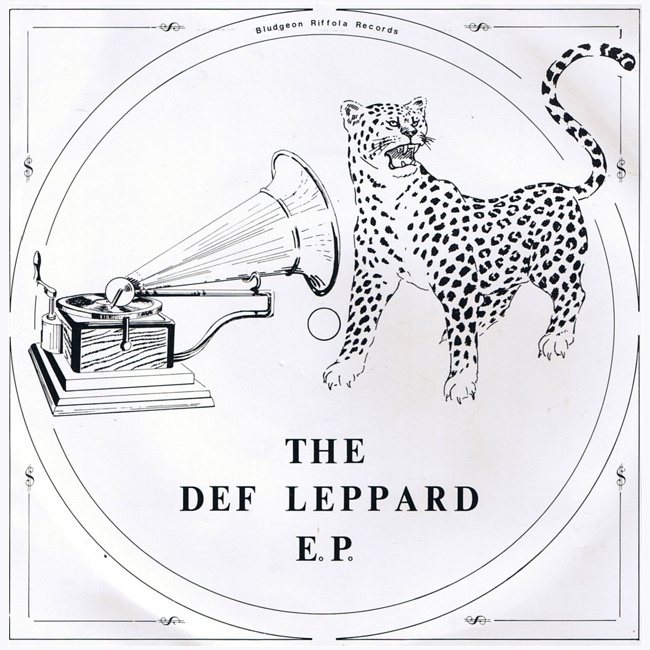 Related Release - Getcha Rocks Off 7"
In January 1979 Def Leppard released the "The Def Leppard E.P.". Their first attempt at recording and debut release in the music industry. This self-financed E.P. was recorded in only two days and featured three classic sounding songs including an epic "The Overture" plus early stage favourite "Getcha Rocks Off" as well as the later-to-be-re-recorded "Ride Into The Sun". This release would kickstart the band's career and they would soon become the most talked about young rock band in the UK before recording their first 7" single and landing support slots with heavyweight acts like Sammy Hagar and AC/DC. The band would return to Fairview in 1979 to record songs for an intended second E.P. only for the idea to be scrapped. These songs were later released illegally by Frank Stuart-Brown as the 'First Strike' bootleg album. The E.P. was reissued in May 1979 after the band signed with MSB (Pete Martin and Frank Stuart-Brown) Management. All three songs were later used with a different running order as the first Def Leppard 7" single in September 1979 (see Singles section). The E.P. played at 33 1/3 rpm speed. In 1989 the band's UK fan club reissued the second MSB E.P. with replica original sleeve as a white label 7". 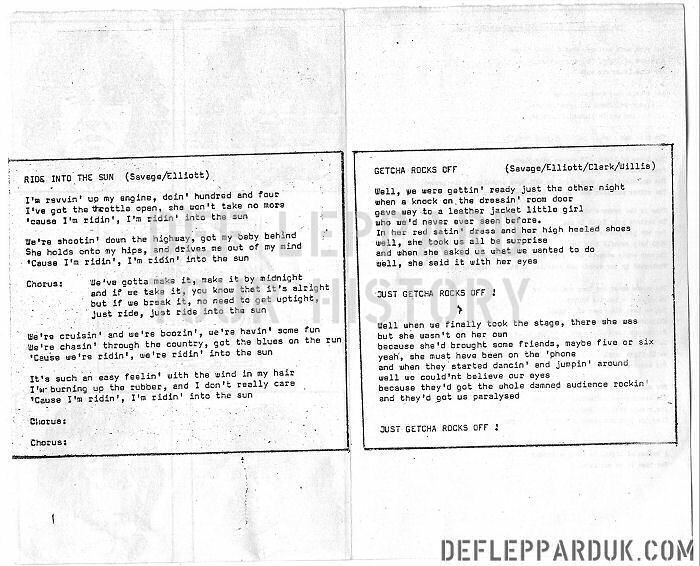 The first 150 or 500 copies of the release on the red label included a two sided signed lyric sheet. Only 1000 copies were made of this first red label release. One side had lyrics to the first two songs. The other side had lyrics to 'The Overture' on the left and the message for Nick Cartwright (see above). 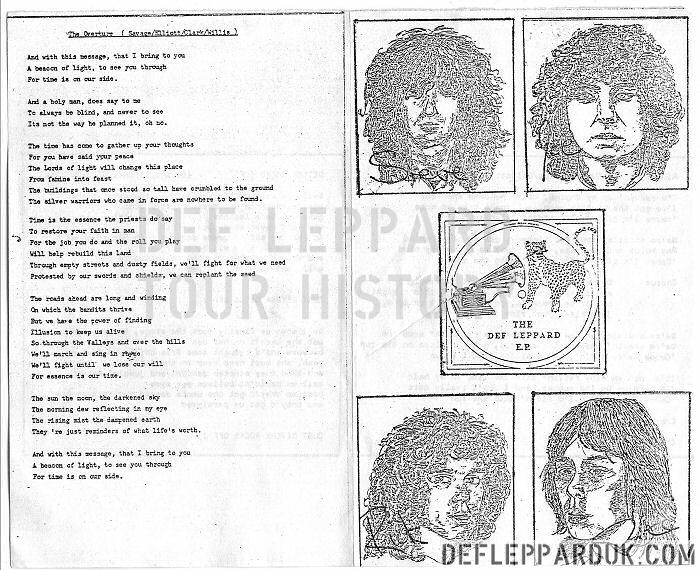 To the right was sketch style art by Dave Jeffery showing Steve/Joe's faces at the top, the E.P. cover in the middle and at the bottom Sav's face on the left and Pete Willis's on the right. Indicating the band were still a four piece upon release before Rick Allen joined them. The sleeves with glued together by Joe and his Mother who also helped mail them out to radio stations, record companies and journalists across the UK. The red label edition can sell for anything upwards of £100. In 1990 the band allowed Lars Ulrich of Metallica and journalist Geoff Barton to use 'Getcha Rocks Off' on their compilation album 'New Wave Of British Heavy Metal: '79 Revisited'. Joe later commented that they never liked letting other people use their music on compilations and that on this release Lars Ulrich did not send them a copy for their approval before the CD was released after they'd sent them the track. This is the only release of an official E.P. version track on compact disc. This CD also featured 'Eye Of The Storm' as track 2 by Vivian's Campbell's first band Sweet Savage. The cover art featured an insert shot of the band onstage at Crooke's Workingmen's Club. It was also issued on double vinyl and cassette. The Def Leppard/Sweet Savage tracks were also included on a 10-track (6 songs plus interview with Lars Ulrich) US promo cassette release.